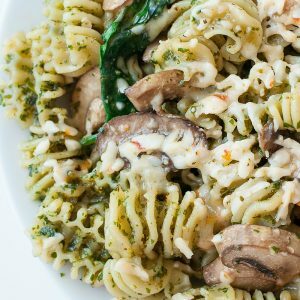 This roasted garlic kale pesto pasta is a tasty twist on the classic! 4-8 oz pasta choose one with ridges + grooves! Grab an entire bulb of garlic and slice a little less than ¼ of the top off, just enough to expose the cloves. Drizzle with olive oil and seal into a pinched pouch of aluminum foil. Roast for about 40 minutes, depending on your oven and patience. Once the house starts to smell like heaven, resist the urge to dive in to the oven and spread the entire thing on toast. Better yet, roast a second bulb so you can do exactly that! Alternatively, you can roast the garlic ahead of time and store in the fridge for up to four days, and simply whip this up whenever your ready for some serious dippage. I typically roast a few bulbs at once and use the golden cloves in recipes throughout the week. Once your garlic is ready, the cloves should practically be bursting from the bulb. I used about half the bulb (6 cloves) but feel free to add extra garlic to taste. Combine all the above pesto ingredients in your blender or food processor of choice and blend until creamy and dreamy! Since everyone's perfect pesto varies, feel free to adjust seasoning to taste as well as the liquid to veggie ratio, an extra drizzle or two of olive oil can thin the sauce as desired. I usually snag a piece of crusty bread and dunk as I taste test, it's glorious! Bring a large non-stick pan to medium heat and saute the mushrooms and spinach in a teeny drizzle of your favorite healthy oil. While your vegetables cook, boil your pasta in a medium pot per the box's instructions. Drain, return to pot, stir in pesto. Add your veggies and cheese then stir baby stir! Spoon into bowls or pile onto plates and garnish with a little extra freshly grated parmesan cheese. Recipe serves 2 as a main dish or 4 as a side. For a saucier sauce, simply add a little extra EVOO to your pesto. Easy peasy! Garlic obsessed? Feel free to sneak a few extra cloves into the mix!